Wordle.net tag cloud for "keep" resolutions generated by responses from Astronomy 210 students at Cuesta College, San Luis Obispo, CA, spring semester 2018. Wordle.net tag cloud for "quit" resolutions generated by responses from Astronomy 210 students at Cuesta College, San Luis Obispo, CA, spring semester 2018. Wordle.net tag cloud for "start" resolutions generated by responses from Astronomy 210 students at Cuesta College, San Luis Obispo, CA, spring semester 2018. 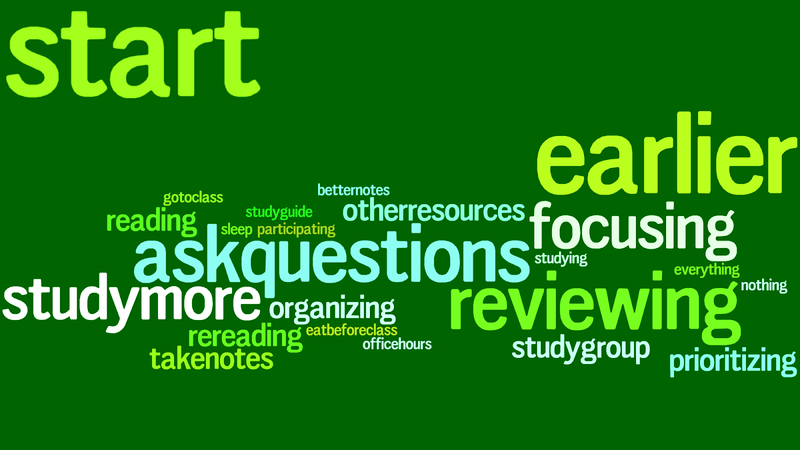 Students were asked to answer a "keep-quit-start" online reflection (hosted by SurveyMonkey.com) on their studying strategies/pitfalls (Mubayiwa, 2009). 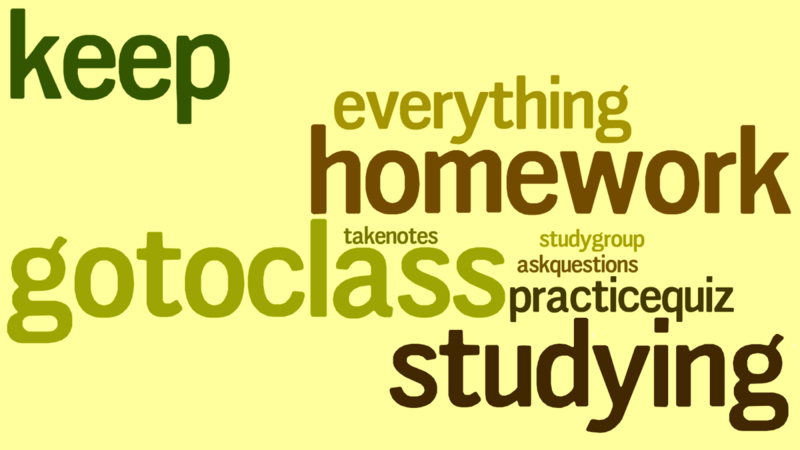 Enter a word or brief phrase that describes what you intend to keep doing to study for this class. Explain your answer to the above question (what you intend to keep doing to study for this class). Enter a word or brief phrase that describes what you intend to quit doing to study for this class. Explain your answer to the above question (what you intend to quit doing to study for this class). 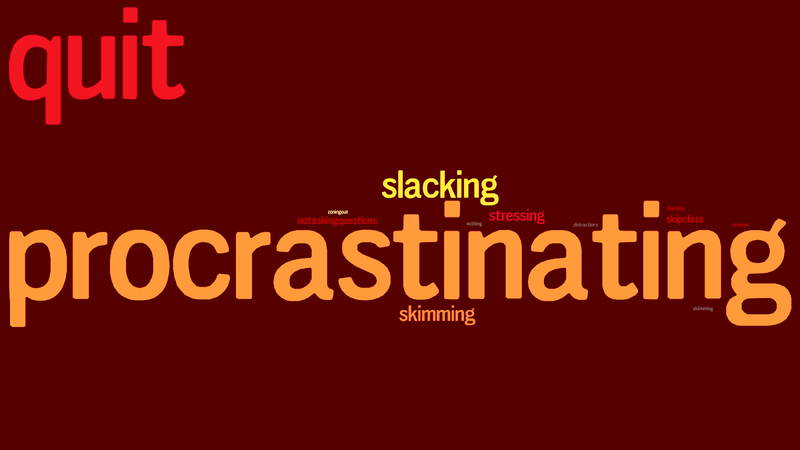 Enter a word or brief phrase that describes what you intend to start doing to study for this class. Explain your answer to the above question (what you intend to start doing to study for this class). I will keep asking questions in class to understand difficult concepts. I am generally quiet person so being in groups helps to understand things better. I feel comfortable asking for help when I need it or am confused. I can ask either you or one of my classmates and I know someone will be able to help me to better understand. I'm already taking the steps to succeed. Despite not doing so well in the beginning of this class if I keep giving my best effort then I should be able to succeed in this class. I show up to class and complete every assignment and have been doing decently in class. I feel I am on the right track. If I keep coming to every class, doing the reading assignments, studying the practice quizzes and keep myself motivated I know I will succeed in this class. Staying on top of it and making sure not to get behind is what is working for me. I will continue to keep up with the text book reading and complete each reading assignment on time. I will also continue to be present in every class and keep up with the notes that you provide in class. I need to keep up my effort to completely read all assigned texts, to preview the slides before class, to submit the surveys in a timely manner, and to pay attention during class time. Reading the chapter before coming into, class ask my instructor or others for help when I'm confused. Lectures help clear up anything that was confusing from the reading assignments. The professor explains these concepts well and makes them easier to understand. You also get a sense of what you need to know for future quizzes and exams by examples given. The in-class group assignments and the overview of the lessons really makes it easier to understand. I plan on continuing to come to class. This has helped me not only because of the material that gets covered but also getting to troubleshoot with my group members. I always think about not going because I am so tired, but when I go I realize how important it is and how much I learn. Attendance helps reinforce topics read about online as well as gain points for in-class assignments. I feel that showing up to class is a crucial part in learning and absorbing material. I need to keep attending each class meeting in order to succeed. Every class counts. Even without doing the homework, you could learn something each class. Maybe even learn enough to pass. Being in class, paying attention, and participating in class I feel that by simply showing up to class and paying attention I will get all the tools I need to successfully pass/complete this course. I noticed that, even if you complete the homework and the reading, if you miss class you completely miss out on detailed explanations that will show up on the quizzes. I need to pay attention to the assigned reading and read all of it before class to stay on top of things. I almost always always forget to do the homework quizzes and remember at the end of the day, I need to keep remembering to do them but preferably earlier in the day. I won't forget to do any and I will keep doing them on time because they are great practice for the tests. I always do the reading in the textbook and get confused...then I will read the presentations and everything gets cleared up. I'm not going to start skipping those anytime soon. I need to keep consistently studying with a strong emphasis on the quiz study guides and class activities in order to succeed in the class. This has helped me get a base line understanding of what we will be discussing in class that week. I have found that by studying previous exams and quizzes provided on the website, I am able to shape my study schedule around the information that is actually needed in order to do well. It really makes a difference to be able to become aware of the test question styles that will be used throughout the semester so that there are no big surprises once the tests occur. I highly recommend previewing the presentations the night before class. It keeps the information fresh. Also, review quiz answers. Keep up with the reading assignments and the online homework. I think it's important and very useful as far as preparation for the next class goes. It helps me have a better understanding of what the next class will be about and be able to keep up easier. The practice quizzes that are provided on the course website are very helpful for preparing for the actual quiz. I have been able to come to every class and I intend to continue that attendance. The in-class activites help me to learn and also give me very needed points. Its something easy that I should be able to continue to do. I want to keep studying the quiz packets and the test packets because those seem to help me a lot on what I need to be learning and lets me have the time to try and understand the material. Reading the book and also the blog is important. Also reviewing the chapters, blogs, and previous test/quiz questions helps to study for the exams. I need to keep assimilating the information. I find it very important and helpful to always fully go over and study the blogs and textbook readings before class. By getting to learn the content before class it gives me a better understanding of concepts I found more difficult when you explain them in class. Reading my notes, presentation slides, and book really helped me get a great score on my midterm. I intend to keep reading all of the assigned materials in order to succeed in class. This will allow me to potentially retain everything I'm expected to know, regardless of whether or not it's currently needed to answer an immediate homework question. When I study with another person, it allows me to verbally talk about the topic with someone else. It helps me a lot because I am able to output information rather than just repeat things to myself. I have friends in class who are very generous with their time and notes, and I intend to keep leaning on them for support when I am not understanding material/need a study partner. I feel like the success for me in this class will result in the amount of time I will spend working on the lessons at home. I feel like if I spend more time at home putting good time and effort into my studying and learning of the content, I will have a major success on the test and quizzes. I need to keep going over the material we learn and talk about in class, out of class and also ask questions when I have any. Studying the day before the text is the only problem I need to stop doing. Sorry, P-dog. I find that when I study I do better on my tests and when I don't I do really bad so I am going to study more. I actually want to make time to study for this class on my test and on the online activity. I got a 96 on the midterm because I spent the time and put in the work necessary to succeed on the exam. just being able to put in the work outside of just attending class is how i will truly learn the material. I spend a lot of time studying for this class and it feels really good when it pays off. I typically will spend about five hours on the material each week but when there is a quiz or a test I will spend significantly more time catching up on the material from class and in the textbook. I need to study more for this class. In order to succeed in this class, I intend to continue to study for exams and quizzes and best prepare myself for the exam day. I plan to keep studying to know the material to pass. Taking notes can help you study better. I take extensive textbook, presentation, and lecture notes and that helps my retention. The less entertainment I have around me, i.e. tv, video games, computer, etc. the more focussed I'll be prepared for class and quizzes. I go into every chapter assuming that I will not understand it, yet I keep finding myself pleasantly surprised by my grasp on the material one I make my way through it. I think the doubt/assumption is a procrastination method. I need to stop forgetting to write notes on the assigned reading otherwise I have nothing to refer to. If there is a subject from the text or something you go over in class that I don't understand, I need to make sure that I am asking help and raising my hand if I am lost. I usually feel insecure about asking for help from teachers when I am confused, because I don't want to stand out as incapable in any way. But I have learned that simply reaching out for help when I am confused can really help save time in the end and point me in the right direction when I am feeling lost. I am doing what I need to do, which is spending as much time between all my other day to day responsibilities on this class. Leaving things till the last minute sometimes causes more stress and doesn't leave time to process needed information Mondays are my Fridays from work, my shifts are from 6am-2pm and I come home and automatically fall asleep, making me wake up late at night JUST in time to do the homework assignment. For second quiz, I procrastinated until the night before. This caused me to get a really low score. If I quit procrastinating and study a little bit everyday I know I will receive a higher score on the quizzes and exams. Procrastinating is my major weakness when it comes to school and I need to keep up with my school work. These homework assignments i've been good at getting them down, but when it comes to studying for a test, I wait so long to start. I don't do my homework and studying until the last minute or the night before which doesn't help my test scores. I want to stop doing things that night and actually study. I will stop waiting last minute to study or to do the homework. I will study more before the tests and not leave the reading assignments to the last minute. Even though I haven't missed any of the online assignments I have a tendency to wait until the last day to fill out the survey and that leaves too much room for variables that may cause me to forget or not turn in the assignment. Reading the night before helps for the homework, but doesn't really stick in your brain for class work. When I procrastinate, I am less likely to retain what I study, and it also leads me to make quick and rash decisions that typically harm my grade. So, I intend to quit procrastinating to succeed in this class, and all of my other classes. Sometimes I wait until later in the week to do the presentation. Waiting till, the last minute to do an assignment and makes sure I ask more question during class. I always do the reading assignments the day before and then I do not fully understand the lecture completely. I often forget to do the before class exercises, and that is where the majority of my missing points are from. Putting off studying is detrimental to my quiz and tests score I need to stop waiting until the last second to study. I need to quit waiting until the last minute to read the online assignments so I can accomplish them to my full ability. Waiting until the last minute to do the reading and homework prevents really soaking up the info. Sometimes I study for this quizzes with not enough time to learn or understand what J will be tested on, if I gave myself more time it would make it easier to learn everything. I have a really bad habit of not spending any time on this class until Sunday before our class on Wednesday. I would prefer spending a little bit of time on the class throughout the week and instead of spending a lot of time on it right before the class. There will be times when I leave the reading until the last minute and I feel like I'm rushing through the reading. I intend to stop procrastinating on doing the reading assignments. Another words, I will read my book more... after all it was freaking expensive. Stop procrastinating on reading assignments because it all just piles up and then I am reading like a mad man stressing myself out. Although I think it is really beneficial to study right before the test/quiz, I tend to leave the studying for the last minute. I want to quit having to cram and try to spread my work so I don't have to stress out before the exams/quizzes and so that the material can be maintained in my head. I love this class and would really to be able to gain knowledge that I can carry with me. When I don't read the assigned sections out of the book I get confused when it comes to the tests or quizzes. Every once in a while I won't read a blog post/presentation word for word. I always do better when I read the entire thing word for word! I just want one 100% on a quiz!! I keep missing one! I keep skimming through the review packets--stop this. What I mean by that is doing all of the text book reading. It can be a lot sometimes but it is also very helpful in dealing with some of the more confusing content. I need to really read and understand the book. I also need to study more. I tend to think that I already know the information and don’t need to study. I have a bad habit of missing class so that when I am unsure of the things that I want to discuss in class, I actually have the opportunity to fixing what I don't know. Also, I could pick up questions that other people ask in class that will ensure a good grade in the class. I also end up missing out on a lot of the easy points I could get from doing the in-class activities. In order to succeed in this class, I intend to quit missing class, causing me to miss out of quizzes, exams, and class activities. I don't study that much for the quizzes and it shows on my scores. I get C's on them and strive for B's. Flashcards really help me, and I have not been making them for this course, though I think they would help me out. I intend to quit slacking off when it comes to flashcards. I need to quit skipping some readings. It puts me behind the eight ball and hurts my understanding. I'm getting bored with life now that we are at this point in the semester, not to mention just exhausted due to work and school at the same time. I need to keep the momentum going to finish strong. Unfortunately I have a lacked studying for quizzes. I need to quit slacking off and make quality time available for me to study for both quizzes and tests. I found that studying the past quizzes really help with the material as well as the midterm! I think that I can definitely do more studying and make flashcards to keep up and memorize terms better. I think I need to calm down and stop stressing so much over the material that confuses me when I'm doing the reading. Lectures clear the material up and I find stressing out wasn't warranted. just feeling overwhelmed from work or other classes can make me feel like I have too much on my plate. I know that if I focus and do what I know needs to be done I can succeed. Only was this not necessary, but it caused a lot of unnecessary challenges in my personal life that would not have developed had I had the confidence that P-Dog did all he could to prepare us for the midterm. Thanks P-Dog! Even though it's a night class and I work an eight-hour shift before class, I plan to try and stay more focused. Whenever I have questions I tend to keep them to myself. With the telescope section, I had a few questions that I never asked. I noticed on the quiz I got A TON of telescope questions wrong. I feel like if I asked my questions I would have had a better understanding of the subject. I've always been so shy as a person and nervous to ask questions in class because I don't to take up other students time if they understand. Although, I know that some students may even have the same question without knowing it, so I need to start asking questions when I have any and not wait. I need to ask question and get clarification when I don’t understand something. I would like to start asking more questions. Asking questions to my group members will help me when I am confused. In order to succeed in this class, I intend to start asking more questions when I am unsure. One of the things that really helped me on the midterm was to ask clarification during studying prior to the exam. My note-taking is definitely subpar compared to others, and it would definitely help having better notes to study for the quizzes. I need to start double-checking how many reading assignments we have per week and actually do them on time. I intend to complete the reading assignments a few days before they are due, rather than the day before, so I can think about the information for a couple days before coming to class. Gives you more time to process everything. I intend to start homework, readings, and studying at least three days before the test so that I have time to retain the information and ask questions if I need help. I am going to start scheduling time to do the before class activities. even though I study, since I don't give myself enough time I can't make it through all the questions, instead if I start studying earlier I can study the whole packet. Keep up with the reading assignments. Eat before class so I can focus better. Study more, read, read through the chapters more thoroughly, and ask more question when needed. I want to be more motivated, so I can start studying and doing great on my test. I will start to put all of my undivided attention towards the lectures, I love astronomy but I just can't stay focused 90% of the time. I really want a 100% quiz score, so I need to really focus when looking through those review quiz packets. I always skim through them which is not helping! I'm totally zoned out during parts of class time. This ties in with the "quit missing class" comment earlier, as I really need to stop missing class because it only helps me to go to class and when I miss class, I am put at a major disadvantage. Once I am able to get into the habit of making it to class again, I will set myself on the path of being successful once again. I've been preparing well for lectures, quizzes, and exams; I see nothing that I need to start doing in order to continue to succeed in class. In order to fully end this class successfully I need to visit you during your office hours. I have so many unanswered questions that need to be answered as well as clarifications on some topics. By directly asking you questions when you have the time is imperative because I don't want to get so far behind. Plus I want to learn and remember what I learned at the end of this semester. I need to start keeping organized and legible notes from the book, in class activities, and online lectures in order to further prepare and identify terms for quizzes and tests. This will make preparation for tests easier and quicker which will hopefully benefit me in the long run. I want to start organizing and making goals to get little things done throughout the week. Like reading half the reading on Thursday, finishing it on Friday, and doing the homework assignment on Saturday. This way I would have the rest of the week to spend on studying and not catching up on the homework. My basic understanding of Astronomy in general can benefit from more knowledge. This is hard to do with my schedule and doing more reading does not always sound appealing. However I have found some very helpful videos that help build my understanding. There are a lot of tools on the blog that we can use as tools to fully comprehend subjects we have not had time to fully go over in class. I will start using these more so that I have at least some general knowledge of the curriculum when I come to class. I need to start participating more in in-class discussions and in the group activities. I believe that if I am just a tad bit more proactive in terms of homework, reading and studying for quizzes/exams I'll be a lot more confident in my knowledge. Therefore, taking my stress away and continuing my success in this class. I have been dealing with a lot this semester, and it has definitely affected my ability to manage my class load. I need to start setting aside more specific study time for astronomy and prioritize my classes more appropriately. I need to start reading from the textbook. I have done a poor job of really reading the text. I skim mostly. Read the presentation slides in full instead of just skimming them. I already study my notes A LOT, but as soon as a quiz or test shows up in front of me I forget EVERYTHING, so maybe spending even MORE time looking at the notes and textbook maybe it'll stick. I often tend to write my notes and forget about them, if I start studying them, I will do even better in the course. I need to read more, and take time to actually understand what I am reading too. I think if I started making practice tests that I would benefit. Doing extra assignments and going over material more to know it better. I really could use more sleep so that I retain more information in my head. I'm too old to do the late-night studying. When I study I either do it by myself or with one other person, I wish to start a study group for quizzes and big tests. In doing so I will be much more prepared for the exams. I think that starting a study group with other students would be helpful so that we can bounce ideas off of each other and really help to get myself and others on track! I need to prepare better for quizzes and tests. I haven't really done any studying before the tests and I know that studying beforehand will help me get 100%. If I want to do better in this class I need to keep studying more. I haven't been doing that lately but if I study harder and more of it the better chance I have at passing the class. I mean I've been doing fine and pretty well, but I will do better when I study. I will begin to study more and actually try to do the practice quizzes. I didn't really study for the quizzes, and if I had, I would have done better. I think that if I start to take notes on the lectures before class I'll be able to pay closer attention during class and not worry about getting everything down on paper immediately. When I do the assigned reading I tend to just read and read and hope that the information I gather will stick, however, a lot of the time I read things and naturally forget them a few days/weeks after. I would like to start taking notes as I read along so I can visit the things I wrote later when I prepare for my quizzes/exams. Another thing is trying to understand the reading better. I have a hard time reading and it takes me a long time so ofter I read as fast as possible so I can get on with my work, but this ofter compromises my understanding of the material so I hope to start taking my time as I read so I can conceptualize and understand the material on a deeper level.